Customer relationship management (CRM) can be distinctively defined as the practice of improving business relationship with the customers, aiding the organizations in customer retention, and sales growth acceleration. As the consumers are availing greater accesses to information from various channels–social media, company websites, and self-service options–the ‘age of the customer’ is the present dominant theme in the CRM landscape. Over the past couple of years, CRM systems have revamped as the market demand has increased for SaaS software. Mobile and Social CRM applications that are built for tablets and smart phones are gradually becoming fundamental business tools that are helping the companies to determine their target consumers. Today, as CRM platform is evolving into a communication forum for customers, the companies are deriving insights from customer interaction data that are captured by the inbuilt tools. This helps companies to treat their customers better and build the brand. To accommodate the challenging requirements of the industries, CRM providers play a crucial role in delivering viable CRM strategies. 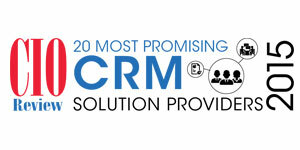 CIO Review has analyzed the strength and capabilities of numerous CRM providers and has chosen the Top 20 among them. The companies featured here showcase vast knowledge and in-depth expertise in delivering CRM related solutions and services. The listing provides a look into the real world CRM solutions and services, so that you can gain a comprehensive understanding of the available technologies, and the advantages they can offer to stay ahead in the competition. Aimia A data-driven marketing and loyalty analytics company. Clari Provides predictive sales analytics that delivers insight to drive action, increase revenue, improve forecast accuracy, and boost sales productivity. Cool Life CRM A firm that offers a cloud-based solution to help businesses manage their clients, data, marketing, partners, and sales pipeline in a cost-effective manner. Deskera A provider of web based CRM solution that offers organization with a single view of customers and helps automate critical sales processes with leads, contacts, accounts and campaign management. PlanPlus Online A provider of Custom CRM Software at a fraction of the typical cost. Modules include Sales and Marketing Automation, Project Management, Helpdesk,Time & Billing,Personal Productivity, and Culture. With expertise in Real Estate, Finance, Healthcare, insurance, Manufacturing,Distribution, and Logistics. SquareBlue Consulting A Salesforce Cloud Alliance Partner, providing guidance on integrating key CRM technology with sound marketing, public relations, business development, and lead generation strategy. Targetbase Incorporates digital marketing principles with analytics intelligence and helps its clients to leverage their information resources provided by the customers. Technology Advisors Technology Advisors provide CRM strategies and technology solutions through its Comprehensive Services and Product offerings. Zeta Interactive Zeta Interactive, with its data, insightful analytics and proprietary technology, helps organizations to acquire, engage, and retain customers.